There’s a lot of confusion around alcohol and breastfeeding. We spoke to an expert for some clarity. All she did was post a photo of her enjoying a glass of red wine earlier this year and the backlash began. ‘Alcohol is authorised when breastfeeding?’ queried one scandalised commenter, ‘Ain’t she breastfeeding though?’ chirped another. The message was loud and clear: Breastfeeding + a glass of wine = Bad Mum (even if you’re Queen Bey). But is that really the case? From pumping and dumping to ‘safe limits’ there’s a wealth of contradictory ‘advice’ out there that’s enough to baffle any mum. 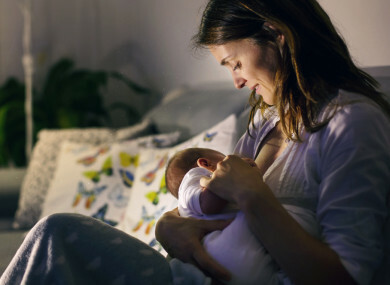 In a bid to clear up the confusion, TheJournal.ie contacted one of the world’s leading breastfeeding experts, Dr Jack Newman founder of the International Breastfeeding Clinic, to try and distil fact from fiction when it comes to liquor and lactation. How much alcohol goes into your breast milk? Both here in Ireland and in Canada, where Dr Newman is based, the legal drink drive limit is a blood alcohol level of 0.05% – roughly the equivalent a glass of wine. You might feel a bit tipsy if your blood alcohol level is 0.05% (you’ve been drinking something that is probably about 12% alcohol) but a level of 0.05% alcohol in your milk is nothing. Some fruit juices have more than 0.05% alcohol. Even after many, many, MANY glasses of wine, breast milk would still contain so little alcohol that it could be bottled and labelled ‘Alcohol free’. Um, if so little alcohol is passing to baby then breastfeeding mums are fine to get drunk –yes? Eh no. The fact that very little alcohol gets into the milk is not a licence to drink irresponsibly. “A baby needs care and even mild impairment is impairment of judgement,” says Dr Newman. You can’t safely look after a baby if you’re drunk – it’s not the milk that poses the potential danger, it’s you. Do breastfeeding mums need to worry about alcohol more than formula-feeding mums? It’s not so much about the alcohol in breast milk but about how alcohol can affect mums’ ability to safely care for their baby. And that’s something ALL mums need to think about, regardless of how the baby’s fed. “It’s the mother’s inability to take care of the baby which is the issue and that’s the same whether the mother is breastfeeding or not,” says Dr Newman. But you can’t drink in pregnancy so you shouldn’t be drinking when breastfeeding – right? Wrong. It’s a completely different process and the amount of alcohol reaching baby isn’t even comparable. Is it more dangerous to nurse immediately after drinking? That’s when alcohol is at its peak in the milk. Yes, it is at its highest but it’s still not high. Dr Newman cites a study done by a mum working in a toxicology lab measuring alcohol in breast milk. One hour after having two glasses of wine and a beer, the alcohol content in the milk was at its highest – 0.07%. “That would be like adding one shot of vodka to 26 litres of mixer,” says Dr Newman. If you’ve had a glass of wine, do you then need to ‘pump and dump’ before feeding your child? Is alcohol in the milk ‘trapped’ there until baby drinks it? But… breastfeeding mums who booze obviously only care about themselves not what they’re doing to their baby. Right? Dr Newman says mums are always contacting him to try and find out the facts about what passes to their baby. “Probably the single most common email question I get asked about is about is regarding drugs/ medication in breast milk. And alcohol is a less common but a steady enquiry,” he says Dr Newman. He reckons people need to know how little alcohol reaches the breast milk before they rush to judge and that it’s more than fine for lactating mums to enjoy a drink responsibly. “Mothers do not have to be saints in order to breastfeed,” he says firmly. So go ahead, embrace your inner Beyoncé and raise a glass to that breastfeeding mamas. You can visit ibconline.ca for more information. Email “Can I have a glass of wine? 8 questions about breastfeeding and booze - answered”. Feedback on “Can I have a glass of wine? 8 questions about breastfeeding and booze - answered”.